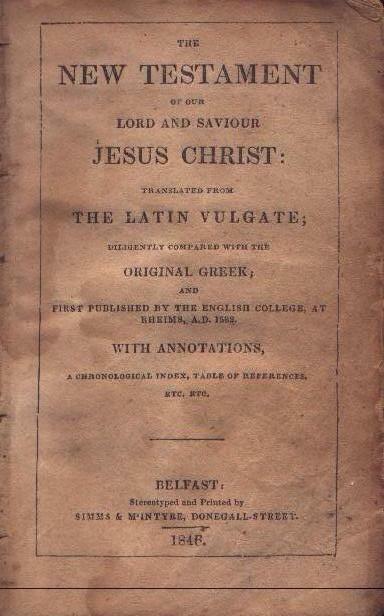 Title The / New Testament / of Our / Lord and Saviour / Jesus Christ: / Translated from / the Latin Vulgate; / Diligently Compared with the / Original Greek; / and / First Published by the English College at / Rheims, A.D. 1582. / with Annotations, / a Chronological Index, Table of References, / etc. etc. / Belfast: / Stereotyped and Printed by / Simms & M'Intyre, Donegall-Street. 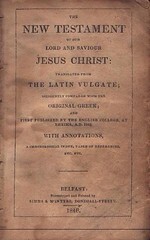 / 1837. 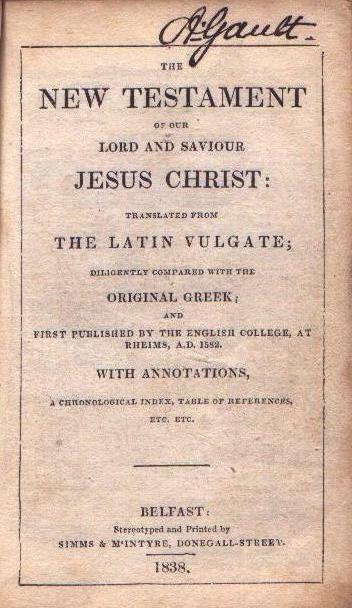 Title The / New Testament / of Our / Lord and Saviour / Jesus Christ: / Translated from / the Latin Vulgate; / Diligently Compared with the / Original Greek; / and / First Published by the English College of / Rheims, A.D. 1582. / with Annotations, / a Chronological Index, Table of References, / etc. etc. / Belfast: / Stereotyped and Printed by / Simms & M'Intyre, Donegall-Street. / 1838. 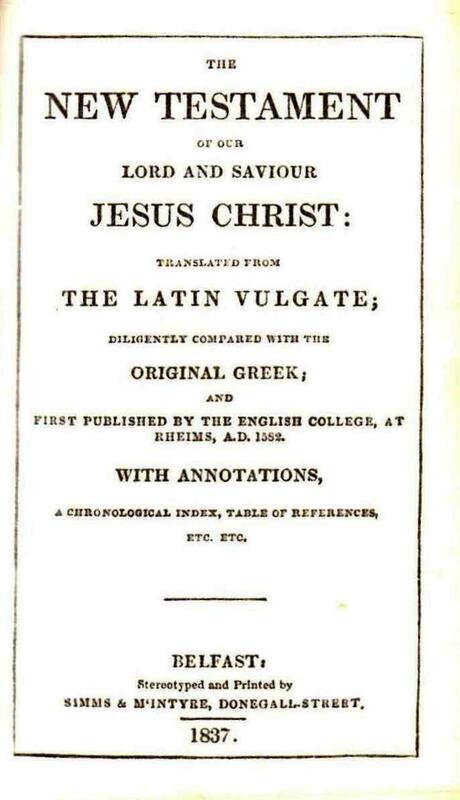 Title The / New Testament / of Our / Lord and Saviour / Jesus Christ: / Translated from / the Latin Vulgate; / Diligently Compared with the / Original Greek; / and / First Published by the English College of / Rheims, A.D. 1582. / with Annotations, / a Chronological Index, Table of References, / etc. etc. / Belfast: / Stereotyped and Printed by / Simms & M'Intyre, Donegall-Street. / 1846.